Peel 3 medium to large bananas (285 grams) and place them in a mixing bowl or pan. Slice them first and then mash with a masher, for over ripe bananas, you can directly mash with a veggie masher. Now add 3 tablespoons jaggery powder. You can add the amount of jaggery as per the sweetness of the bananas. Add more or less as required. you can also add sugar instead of jaggery. mix very well. Then add 1 cup whole wheat flour (atta) and 1/2 teaspoon lightly crushed fennel seeds. you can also add whole fennel seeds. Add water in parts. Then begin to mix it with the flour. You can added 3/4 cup of water. depending on the quality of whole wheat flour you can add more or less water. Mix very well and make a smooth batter without lumps, the batter has to be like a dosa batter and have a medium consistency. Now heat a pan. Spread a bit of oil on the pan. you can also use ghee or butter. You can use nonstick or a cast iron pan. Keep the flame to a low. 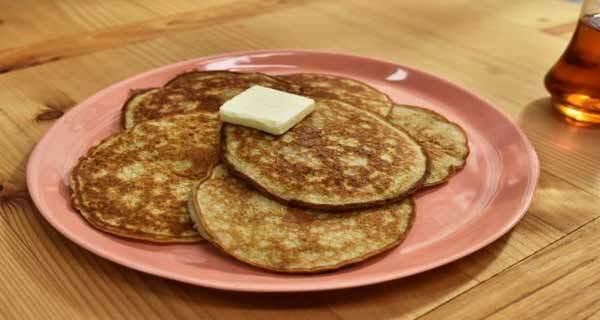 pour a spoonful of the batter on the pan and then gently spread it, do not spread too much, just make small pancakes. when the base gets golden and slightly crisp, turn over the banana pancake. Cook this second side till it gets golden. if you want you can flip and cook once or twice, remove the banana pancake and stack them up in a warm casserole.